This post will work a little differently than the 2004-2008 post. I don't have all the information of what will and will not work. That will be left up to you and your posts (and pics!) of what your rolling. With a 2.5' leveling kit on a 2wd you should be able to run 33's. With a 6' lift on a 2wd you should be able to run 35's. With a 2.5' leveling kit on a 4wd you . . . . can you run 35's ? We'll have to work this out in the post. With a 4' lift (Rancho) you can run 35's. With a 6' lift (Procomp, fabtech, etc.) you can run 35's . . . can you go bigger than 35's? Anyone? With more than 6' lift how big can you go? 1. MOST IMPORTANT - PLEASE POST IF YOUR VEHICLE IS 2WD or 4WD. Otherwise the information you provide will be fairly useless. 2. Please indicate tire size as it reads on the tire. Example - don't say "33's", please say 285/70/17 or 33 X 12.50. A narrower 285/70/17 which measures 32.7 X 11.2 tire should clear better than a true 33' X 12.50. 3. If you know it include the brand of wheel and measurements (ex. 17 X 7.5), including backspacing. Backspacing is pretty important. 4. Please include your leveling kit/lift kit information including brand and amount of lift. Please indicate the amount of lift in both front and rear. 5. Let us know what brand tire it is, there are differences in more aggressive sidewall tread that could create rubbing. 6. If you went bigger than you should have on your tire, let us know how you remedied it. Try to be as descriptive as possible of what, and how you trimmed to make those monster tires fit. 8. What you paid for tires and/or wheels never hurt. Nobody wants to get ripped off and having an idea of what others paid helps. I can't think of anything else relevant at the moment but I am sure if I missed something someone will speak up. I know I am asking a lot of info. here, but we all love to talk about are trucks so it shouldn't be a problem! Thanks ya'll. Last edited by Lenn; 11-01-2012 at 01:04 PM. And here's my 2010 F150 2WD 4.6L, 2.5' leveled in front by Bilstein adjustable 5100 shocks, 1.25 leveled in the rear by Roadmaster Active Suspension. I am riding on Pro Comp 7005 rims measuring 17' X 9' with 4.75' backspacing. My tires are "E" rated BFG AT KO's measuring 285/70/17, which is a little smaller than a 33', about 32.7 by 11.2. Initially I lifted the front only and experienced no rubbing on the road. It looked pretty level too front to back, but under full articulation offroading the left rear tire rubbed the fender and put a nick in the sidewall at the very uppermost portion of the tread. So just a 2.5 inch front lift won't work in all circumstances with my tire. You need some rear lift too. The nick was about 1/2 down from the top of the tire, so with a 1.25 inch lift in the rear now, it shouldn't be a problem anymore. I can't wait to test it! Oh yeah, and I paid $1913 out the door for the tires and wheels, tax was 10.25%. Each tire was about $260, largely due to the "E" load rating. Truck looks good!! Very useful post already, seeing how I just bought a 2" leveling kit and getting ready to buy rims and tires. Thanks. My issue with nicking the 32.7 X 11.2 BFG's in the rear (before rear lift) motivated me to get the word out. Nobody wants to mess up their new tires. ok so I was wondering what would be a good wheel and tire combo on my 2010 stx 4x4, im gonna get a 2inch level kit, I want my tires to look mean and have a wider looking stance can anyone help me?? would be nice for people to post there setups, with mesurements like B/S offset with etc. Lets face it, when u say my rims are 18x9 that dosent help anyone out for fitment. Good Thread. Should be a sticky. this is going to be real helpful. 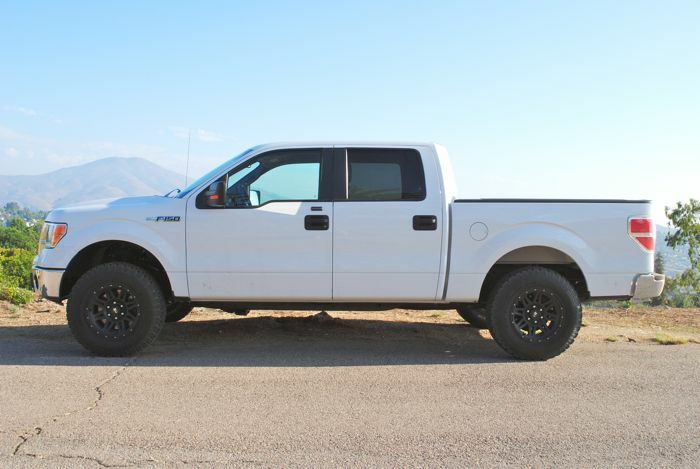 I have an 09 FX4 super crew and want to level it with Bilstein 5100s and run 33 terra grapplers or BFG all terrains but dont know what exact dimensions I should go with. Right now I am running stock 275/55/20 pirellis. I want the tires to stick out a bit but not obnoxious.